An sprawling alternate history novel wherein a young man’s life is upended by a the existence of a mysterious device that purports to tattoo a description of your true self on your arm. The Epiphany Machine is hilarious. It’s a razor-sharp alternate history ... Venter’s circular arguments about himself and society are funny even when they’re depressing. Gerrard’s novel emphasizes just how desperately people want confirmation of their place in the world. Gerrard is committed to giving us flawed, potentially unlikeable narrators at the forefront of each of his books, something I love ... the way The Epiphany Machine leapt from cult Boomer relic to adjacent to American paranoia ultimately worked for me–it was something of a narrative leap, but it clicked. And the section about two-thirds of the way through, where nearly every epiphany ends with but is stronger than terrorists seemed like a perfect (and unsettling) evocation of the early years of the Bush presidency. ... [a] superb novel ... This is a wildly charming, morally serious bildungsroman with the rare potential to change the way readers think. 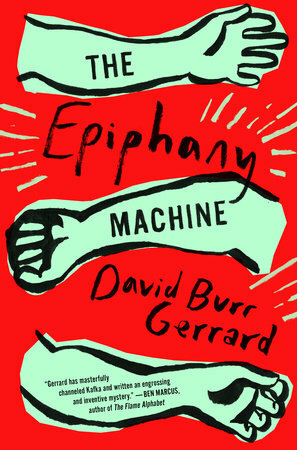 What did you think of The Epiphany Machine?